Great product. Is as advertised. Makes a world a difference on my patio. This user was entered into a sweepstakes after submitting their honest review. 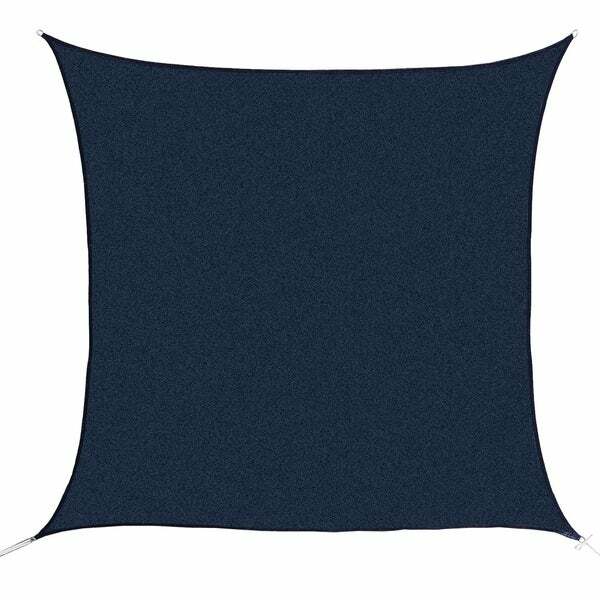 This 24' Square Sun Shade Sails are a very functional and economical way to protect and shade your outdoor living areas. They effectively reduce heat on your patio, backyard and other outdoor areas because they provide excellent protection from the sun and its harmful UV radiation. Constructed with woven high-quality and high-density polyethylene weave fabric (185 gsm), the sun shade blocks more than 95% of harmful UV rays. The weave fabric material is color-fast and won't rot, mildew or mold. Beat the heat with this must-have summer item which lowers the temperature beneath it by up to 6.5 degrees. They are wonderfully versatile; they can be attached to homes, trees, patio columns or used with Outsunny's convenient Installation Pole (not included). Dimensions 288.0 In. X 288.0 In. X 1.0 In. Good price. Just wish they had more colors! After pricing other tarps, this one was much lower than others we had shopped for at other competitors. We wanted a lighter blue color, but the navy blue works out just fine. Great product. Is as advertised. Makes a world a difference on my patio. "do you have a 30 by 30"
Hello, thank you for your question! 24' x 24' is the largest we carry, thank you! "Is the patio shade 24’x24’"
Hello, thank you for your question! This is 24' x 24' with 4 D Ring as well, thank you!